I advise most of my clients to avoid the scale. The scale RARELY elicits happy feelings. Excitement? Joy? When is the last time you have associated either of these feelings with what you see on the scale? More often than not the scales leads to thoughts and feelings of disappointment, anger, frustration, depression, etc. So why do we continue to use the scale as a measurement? 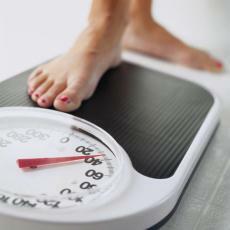 Most of us have an unhealthy relationship with the scale – we are drawn to is, as one of the few measurements we know. And it sure is the easiest and most accessible – isn’t it? There are numerous problems with weight. It fluctuates. Your body is 70%+ water – so dehydration is a significant factor. What did you eat or not eat yesterday. How did you sleep. What time of day is it. Females, where are you in your cycle. What are the weather conditions. There are countless factors that influence weight – and cause us unnecessary frustration. The the scientific and physical reasons aside, weighing yourself and having weight goals is psychologically defeating. This is why I emphasize the importance of having weight independent goals on your journey (also known as life). I try not to weigh myself, because I know that it elicits negative thoughts that lead to negative self-talk. I weighed myself today. I have been feeling pretty good, but I knew that my pants were getting tight. Since eliminating long runs from my training plan (I do not have any more races coming up), I have not integrated heavy leg days back into my routine. This is the primary cause for my shift. Dietary habits – of course – are a huge factor, although overall my eating has been pretty good. But where is my mind? Why didn’t I add leg days? Why did I eat that ice cream when I wasn’t hungry? Why don’t I run more? Which becomes, I should have kept my running up. Getting on the scale is a mental, emotional, and psychological disaster. We are anxious prior to doing it. We are, more often than not, upset or frustrated afterwards. My general rule is to avoid those activities that trigger or elicit negative thoughts and feelings. This means, the scale must go! Please answer the following questions with your desired weight in mind. Why do you want to be this specific weight? Is there anything particularly special about this weight? Have you had other weight goals in the past? Why were they different from your present goal? When were you last at your desired weight? How hard do you think it would be to stay at this weight? How important to you is reaching your desired weight? If it is important, why is it important? How would your life differ if you reached your desired weight? What could you do that you cannot do now? Or, if you have previously been this weight, how was your life different when you were at this weight? How would you feel if you did not reach your desired weight? What effect would it have on your daily life? After completing this exercise, you may find that your weight goals are unfounded, inappropriate, or unrealistic. You may find that they are adequate. If your goal is to be the same weight as your 20-year-old self, that may or may not be a good weight at this point in your life. These questions should help you to think critically and make the best goals for YOU. Lastly, support your journey by settings goals that focus on health, energy, and happiness. When is the last time the scale left you thinking and feeling positively —? Or even neutral? Many of us have difficulty saying no. I for one, have GREAT difficulty saying no. We have difficulty setting relational boundaries – unable to say no to friends and often overcommiting ourselves or doing things we do not want to do..
We have difficulty maintaining work boundaries – unable to say no to our boss’s every request, working long hours and bringing work home. We have difficulty with food boundaries – unable to say no to food that seem to stare us in the face daily or not knowing when to stop. Read on to learn how I strengthened my no muscle. As with anything, saying no can become easier with practice. And the more you do it, the easier it becomes. It is like a muscle, use it and it will become stronger. There is an abundant amount of research out there supporting the notion. We call it willpower. Scientists call it long-term potentiation (LTP). When you practice saying no, you can strengthen the nerve cell connections in the brain – when the connections are strengthened they are potentiated (Amen, 2010). Practicing over time strengthens these circuits and builds what we know as willpower. LTP occurs whenever these circuits are strengthened and practiced and the associated behaviors become almost automatic (Amen, 2010). I tested the LTP theory years ago. I had always felt like I had no willpower – prone to binge drinking and eating. I had begun working with a trainer and saw the weight loss benefits. Wanting to see what results I could truly obtain, I quickly modified my diet – strictly following the guidelines that I provide in my meal and snack creation post. At the time, I was having difficulty with giving up my beloved Snickers candy bars. Having read about LTP and that it is possible to increase willpower. I thought I would test it out. I took a “Fun Size” Snickers bar to work and placed in in front of my computer monitor. At the time, I worked in publishing and sat in front of the computer for 8-10 hours a day. My goal: I will not eat the Snickers today. I sat there all day with the Snickers in front of me. I practiced saying no. Some might argue this was desensitization (it may have been). I wanted to, but I did not eat it! I set the same goal for the next day. I would tell myself, I did not eat it yesterday and I do not need to eat it today. This went on for months. More than a year. Eventually the Snickers bar was so old that it wasn’t appealing (although I am sure it has an absurd shelf life) and I threw it away. I had built willpower and the ability to say no. This brief summary omits the days of stressful deadlines, when I almost ate that bar. I didn’t mention the emotional days, when I wanted the candy bar, but said no. It doesn’t mention my colleagues – who all thought I was crazy – who were nay-sayers and bullied me to eat it. For me, it was Snickers. At other times, it has been saying no to clients who want to train with me during periods that I am generally unavailable. There was also a time when I needed to learn to say no to alcohol. I challenge you to think about what you need to say no to. Starting today, you will practice. It starts with 1 day. Then 1 day becomes 2. And if I can do it — so can you. So tell us, to what are you going to practice saying NO? Amen, D. G. (2010). Change Your Brain, Change Your Body. Three Rivers Press: New York. We played with video today. I have said before that I do not intend to share too many workouts, but it was on my heart to share this one. A simple – but not easy – workout, comprised of 4 circuits. Rest 1 to 2 minutes between circuits. You can view a video tutorial on this workout on my Facebook page. Muscles = You must be a bodybuilder? It is really funny actually. I cannot tell you how many times I have been asked if I am a bodybuilder. I have been asked by roommates. I have been asked by strangers at the mall. I have been asked by strangers at gyms where I workout. I have been asked by strangers at gyms where I work. I have been asked by men, women, boys, and girls. My friend Emily gets asked this as well. Neither of us looks like a bodybuilder. It has become a bit of a joke between us. I have narrowed it down to the fact that we are women, with muscle, who look like we know what we are doing in the gym. This accounts for the comments in the gym. And more than knowing what we are doing, we are not afraid of the heavy weights and are actually drawn to them – I would much rather do 4-6 reps of heavier weight than 12-15 reps of less weight. And for some reason, people associate heavy weights with bodybuilding – when bodybuilders actually use lighter weights for the bulk of their training. If you know what you are doing in the weight room and you lift heavy weights, then you are a body builder. When I let myself dwell on the comments, I can get down on myself. I have shared much about my battles with body image, and comments can trigger rampant thoughts. Out of season, bodybuilders often carry a significant amount of subcutaneous fat – a result of the considerable amount of calories required to build muscle and support the training regimen. I think, I know my body carries some subcutaneous fat, and I am okay with that – but how big do I look? There was a period in my life when I thought I would train for a competition. That season of thought has long since passed – there is no need for me to purposefully harm my body and risk significant metabolic damage. For what result? To stand mostly naked, in insanely high heels, and holding uncomfortable poses on a stage in front of individuals who are judging me? I will pass. While I like goals, and my body would likely adapt well to the physical training, I have no desire to put myself in the position of being judged based SOLELY on my appearance. Opposed to bodybuilders, I train for life. I train for getting in and out of the car, impromptu hula hooping contests, unexpected basement demolitions, and so forth. While a bodybuilder may appear strong, most individuals would be surprised by their lack of functional movement and use of those big muscles (this is a broad statement and is not representative of ALL bodybuilders). This falls along the lines that models cannot do pushups – there is an overall disconnect between appearance and reality. When I have been asked if I am a bodybuilder, sometimes it comes across as a compliment and other times as an insult. The first few times, I let it get to me. Now, I just shake it off. Sometimes, individuals just do not know what to say and that is what comes out. I love being strong and muscular, so I chose to take it as a compliment every time. And now every time either Emily or I hear it, we laugh and it causes a day’s worth of amusement. I am not a bodybuilder. None of my friends are bodybuilders. I trained a friend for a figure competition – she is not a bodybuilder. We are strong – and have trained for life and the many obstacles it throws our way. Further, I am not opposed to bodybuilding or figure training, it is just not for me. Last week, some friends, strangers, and I completed an obstacle course workout at TNT Fitness. Amazing! Looking at the obstacles from a distance was a bit daunting. My heart raced. I was concerned that my knee, hip, and shoulder would inhibit my ability to successfully complete some of the obstacles. I worried that I was not strong enough to conquer the obstacles ahead. I did not feel strong enough for the obstacles laid out before me. I did not feel equipped. As usual, I put my game face on and I prepared for the obstacles. Do not think, just DO IT! Those who know me personally, know that I overthink. I was thinking about the hip that was sore. I was thinking about the calluses that I had recently ripped off my palms. I had to center myself and stop thinking. When I find this space of not thinking is when I find my strong. Not traversing the wall was not a choice. Not flipping the tire was not an option. Skipping or avoiding obstacles was not an option. Digging deep and being strong was the only choice. And we worked as a team to help others get up and over – sometimes lending a helping hand and often cheering and encouraging one another. My strength came not only from digging deep within myself, but also from trusting others. “Mini Mt. Everest” was a mental challenge for me. I was afraid that I could not do it. My friend Mo went first – and he stood at the top waiting for me to come. I was confident that if I did not make it, he could reach for my arm and help to pull me up and over. The best part, this gave me the confidence to do it. With my physical strength, I managed to overcome that obstacle alone. But I drew my confidence and mental strength from others. My life has changed pretty significantly these last few weeks – in positive ways. But there have been numerous obstacles. One after the other. And there will continue to be one after another. Just like last week’s obstacle course workout, not attacking those obstacles is not an option. I have a vision for my life – my personal and professional endeavors. I have a rough timeline for where I would like to see myself in 5 or 10 years. There are education and experiences I desire to obtain. But God and friends have a different plan and timeline for me. The vision, the same, but put on fast forward. I do not feel strong enough. I do not feel equipped. These are the same thoughts I experienced prior to the obstacle course workout. Life is an obstacle course – and I need to learn to treat it like the one that I recently conquered. I conquer fears one at a time, and I suppose obstacles in life are to be overcome in much the same manner. Much like the obstacle course workout, I have friends who are reaching out to grab my hand – ensuring that I do not fall or hit my face. The faith others have in me today, helps me to build my confidence and push forward with determination. The obstacles are inevitable, but I know that the hands are there to grab onto. I am ready to attack this life as the obstacle course that it is! How much can you improve your fitness in 6 months? My 2013 six-month fitness check-in. With many fitness goals, I am using the bodyweight baseline workout to assess where I am at. I did not review my previous performance before heading off to the gym – I had no idea what I was trying to beat and I did not want to psyche myself out. I just wanted to do it. I put my game face on and I went. I did not go into the workout with confidence. Honestly, I had forgotten about my assessment workout, until I looked at the calendar yesterday and realized it was July. My workouts have been on the back burner lately – lacking focus, intent, and energy. This made me nervous, but I knew that I needed to complete the assessment and know the results – the good and the bad. Following this workout, I completed my 1-mile run in 8:53 minutes, improving from 9:18 in April (and having not completed the mile in January). I am surprised with my improvements. I am not surprised with my decrease in burpees since April, as I have been experiencing more back pain these last few weeks (no more Insanity experiments). The 3 minutes of pullups were frustrating, as I was only able to perform one at a time. All I could think about was my goal to perform 10 consecutive and the fact that I have not been training for it as diligently as I should be and that is why it was so hard. Mind games! All in all, I am pleased. I did better than I thought I would. A lesson to be kind to myself.